View cart “The Love Letter: Meet & Mingle for 17 to 30 guests (29 females and 1 optional male role)” has been added to your cart. The perfect idea for a tea party, bachelorette party or for any girl parties anytime! It is 1807. 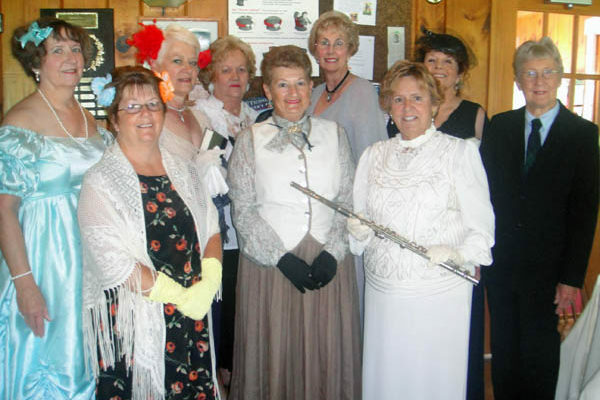 Lady Mazzing has invited eight young ladies to her mansion for high tea. Her son Lord Edward Mazzing dies with a love letter in his hand. 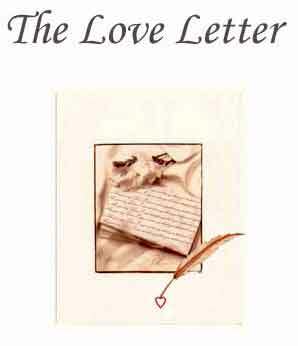 The mystery is to find out who killed him and for whom the love letter was intended. All girl except for one optional brief male role. Her one and only son Lord Edward Mazzing will briefly greet the guests, but he will not be joining them for dinner as he has other work commitments. Since his father’s death two years ago, the young Lord has taken over the responsibility of managing their large estate. 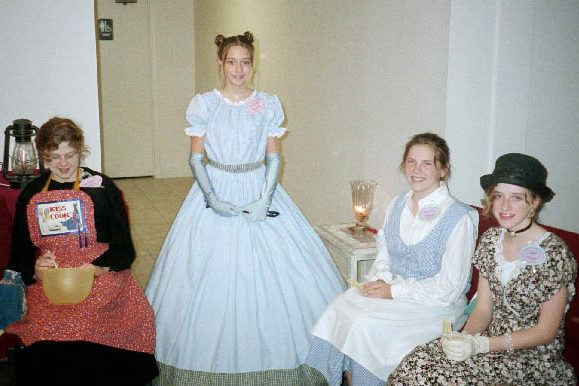 Secretly Lady Mazzing views this social event as an opportunity to acquaint herself with the young ladies who may be suitable marriage partners for her son. 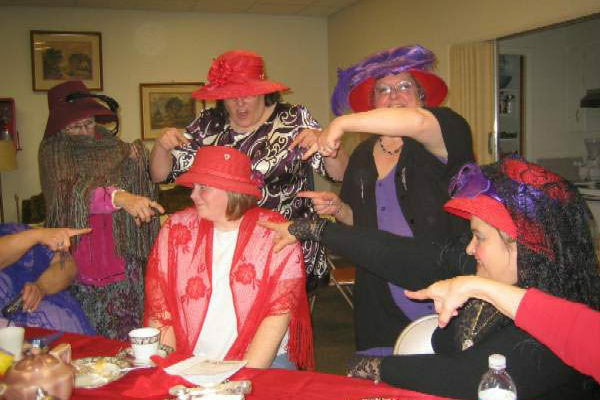 See photo no.4 above from Cathy Wilson’s (Queen of the Snake River Scarletts Red Hat Society) “Love Letter” party. Note: The reading levels of each kit (not just “page” as it says below) were determined by copying and pasting the kit (the play version), into The Readability Test Tool (see www.read-able.com). I am a dignified lady of very particular tastes. Since my poor dear husband died two years ago from a goose bone stuck in his throat, I have never been able to bring myself to serve goose at the table. I am a handsome woman who knows what it is like to be born into wealth and opulence. I have no close friends and nor do I want any. My son is my only real interest. People say I am a very charming, handsome man, but I do have the reputation of trifling with women’s feelings. The fact is some women bore me so terrifically I have to move on to another one. I am very wealthy and somewhat arrogant. My mother loves me very much and is my greatest admirer. I am a refined and gentle young lady of somewhat delicate disposition but when the weather is fine I love to sit outside and capture the beauty of flowers with my watercolors. I spend a lot of time doing good works for the poor and people say I am a very kind hearted person. My father has extensive business investments in Virginia. I am fond of riding side-saddle and love the outdoors. My parents worry that I am somewhat more forthright than a lady should be and that I am apt to be quarrelsome in nature. My parents own a gunpowder factory. I like to ignore the constraints of civilized society. I excel at tapestry and singing and am a lady skilled in all the social graces. My parents are very well-respected and we are an influential family in the community. Although I appear to be gentle and quiet, my brothers say I am rather headstrong and stubborn. I often take the buggy for a ride by myself much to my parents’ dismay. I am an only child and of a somewhat shy disposition. I am very skilled at lacework and I love Shakespeare, especially the tragedies. Sadly my father recently made some unfortunate investments and my family is facing economic ruin. I am terribly embarrassed by my situation as I am used to wealth and all the luxuries it affords. People say I am very gracious and I love to read poetry. My favorites are Samuel Taylor Coleridge and William Wordsworth. I am also a skilled pianist. My father owns numerous cotton plantations. I traveled abroad with my family when I was younger and I yearn to travel again especially to London. 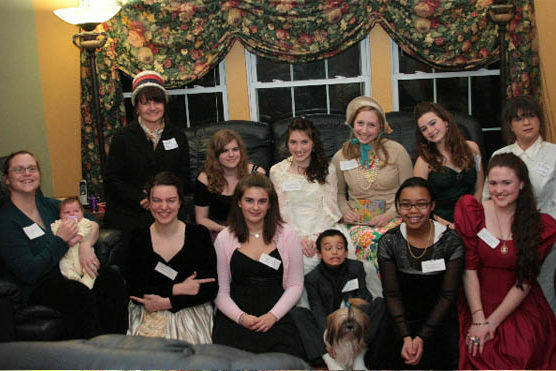 I miss the operas and plays dreadfully. People say I am rather intelligent. I must say, I do love puzzles and am very fond of writing. There are some false rumors going about that I have been secretly writing mystery novels under the nom de plume of James Ridley. I am very polite, but prefer to observe rather than talk. My father is a highly respected surgeon. My mother is afraid that my mental abilities will frighten men away so she tries to make me appear a silly little girl in public. She insists I wear pink and lots of frills and bows in my hair to make me look more feminine. I am just back from finishing school in Paris where I was greatly admired by all. I have a definite flair for fashion and am terribly fond of dancing. At the Paris Balls all the men wanted to dance with me. I also have a beautiful singing voice. At the moment, I am passionate about the color mauve and I wear it a lot. It’s so fashionable. My father runs a merchant shipping company, which is terribly boring. My father is a Duke and he loves me so much he had one of his gardeners plant a rose garden for me, which I treasure. My mother died when I was young and my brother is an army General. 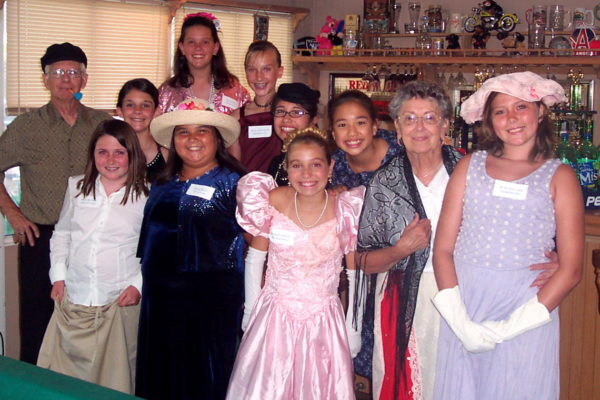 I am fond of entertaining and my father encourages me to hold tea parties. I play the flute admirably. Although I have no particular interest in getting married myself, I like to play matchmaker whenever I can. Note: The role for Lord Mazzing is a brief optional role. He is only involved in Act One and the beginning of Act Two in the Standard and Play versions.